A milestone global health victory has been achieved in the war against disease: Nigeria—and with it, all of Africa—is now polio-free. It is an accomplishment that has brought the world to the brink of eradicating the crippling virus, with only Afghanistan and Pakistan still struggling to conquer the disease. Working in northern Nigeria as part of the CGPP – which is supported by USAID– International Medical Corps drew on our highly respected training expertise to join the fight against polio. We provided local government workers, non-government staff, and volunteers, with the skills needed to increase polio vaccination rates—rates that had seriously lagged behind due to terrorist attacks and atrocities in a region that includes Boko Haram’s home areas. We began in Kano State in March 2015 and six months later expanded our polio and other vaccine efforts to Borno State, where Boko Haram is active. Our local partners in these two states are Nigerian NGOs, Community Support and Development Initiatives (CSADI) in Kano and African Healthcare Implementation and Facilitation Foundation (AHIFF) in Borno. Despite the violence, we were successful in lifting vaccination rates from the 20-30% range to an impressive 99.96% rate in Kano and 96.8% in Borno. Such high vaccination rates don’t just happen. They are the result of careful planning, organization, and coordination—all skills that require a variety of training curricula. For example, supervisors are trained on how to use smart phones for tracking project activities at neighborhood and community levels; on how to use registers filled out by volunteer community mobilizers (VCMs) to assure no households are missed. VCMs are trained on how to find and engage pregnant women and new mothers, encouraging them to bring their children to immunization sites for vaccinations, and also on how to find and report young children suffering from paralysis—and possible polio. 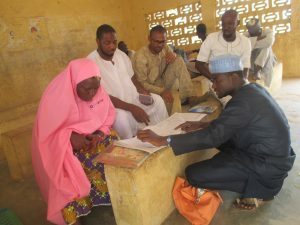 Local government staff and volunteers were also supported and mentored on ways to address community suspicions about the vaccination campaigns, which generate outright resistance to immunization. One such incidence occurred when, for two subsequent rounds of monthly campaigns, community residents in one district area did not allow any of its children to be immunized, significantly increasing the likelihood of children contracting polio. In response, the local government formed a team with UNICEF, Rotary Club, International Medical Corps and local government health officer to meet with community health officials, local council members as well as community leaders and engage in dialogue to address the causes for resistance and ease concerns. Residents at the meeting resented that the polio campaign had been prioritized over other neglected community needs. The community lacked essential services, including clean water, and treatment and prevention against other diseases such as malaria and cholera that also killed children. Medicines were either not available or too expensive to purchase. These concerns expressed by residents were genuine and had to be dealt with honestly. The team initiated a dialogue under the leadership of a local traditional leader, to resolve the complaints. Once community residents could see their complaints being addressed, the resistance ended. With an action plan agreed, a house-to-house polio immunization campaign followed that reached every child in that community. It was only with countless similar dialogues, with explanations and persuasion on both sides, along with effective immunization strategies that those involved in the effort managed to rid Nigeria of polio—one child at a time. Today, International Medical Corps, as all CGPP partners, remain vigilant in Nigeria, focused on the steps needed to consolidate the public health victory once the World Health Organization certifies the country polio-free in 2017—a triumph that would not have been possible without the tireless efforts of frontline health workers.